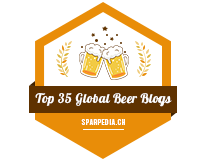 RateBeer.com released their annual RateBeer's best last week and Vankleek Hill, Ontario's Halcyon Barrel House was rated as 4th best new brewery in the world! 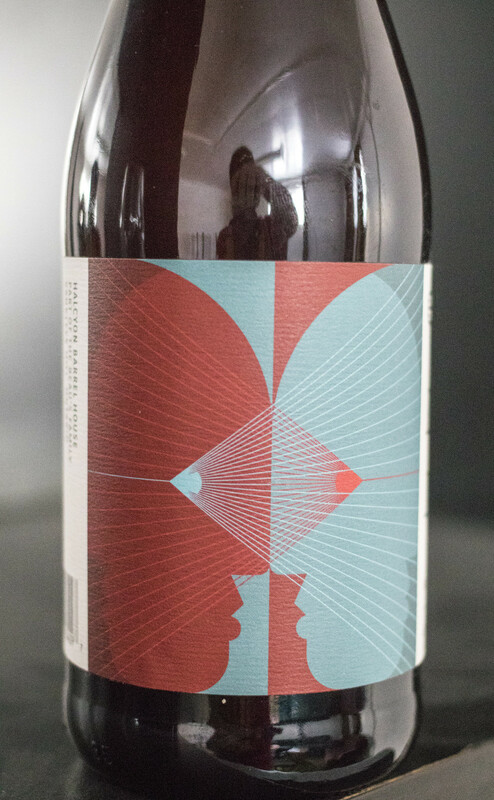 Halcyon is part of the Beau's All Natural family so I was excited to see the brewery get some attention. 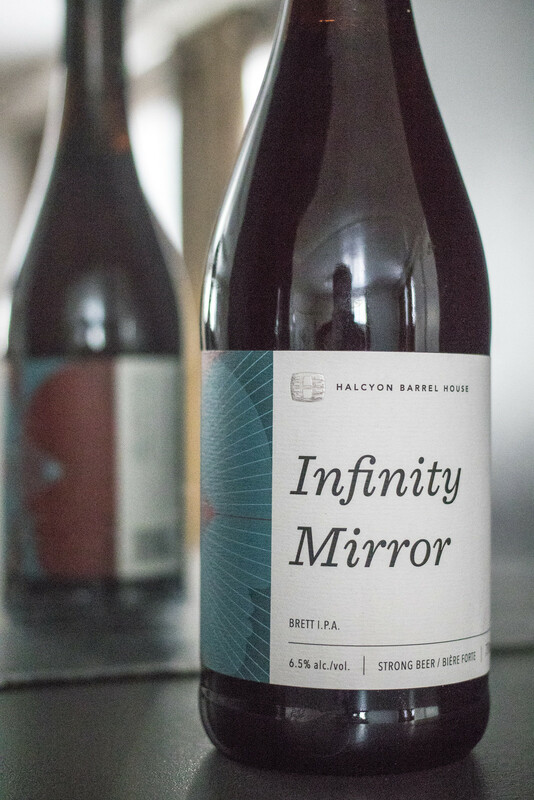 I was lucky enough to try Halcyon's Infinity Mirror while at Beau's and also got to take home a bottle to sample and savour. 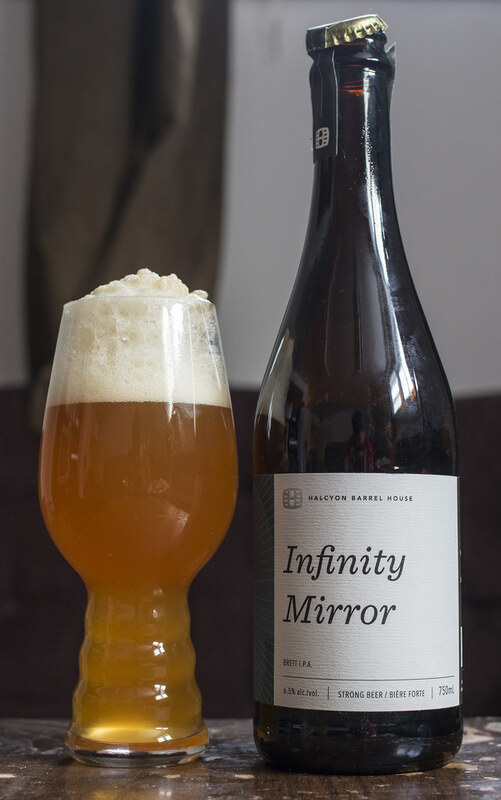 Many months later, I'm finally opening the Infinity Mirror.. for some reason I forgot that this was a Brett IPA and I guess thought that this would be a stout or something. Well, IPAs don't age well but I've had decent luck with drinking forgotten IPAs lately.. so I'm expecting this to turn out alright. Appearance: Incredibly foamy beer, not a gusher at all, but it takes a looooong time for the head to go down before I could finally review this. The body is a cloudy orange with a bit of carbonation. 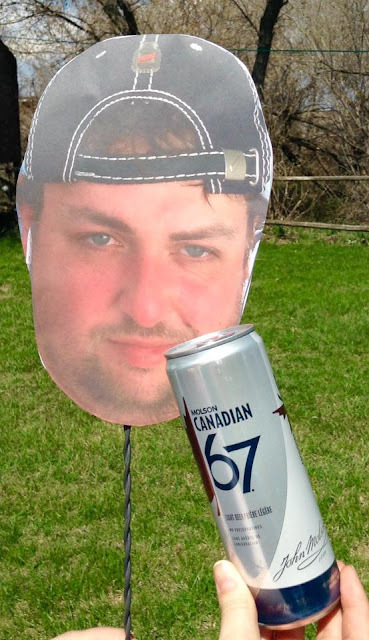 The head eventually dies down and leaves behind a beige foam lacing on the sides. Aroma: The Brett yeast is the most dominant aroma I'm getting here - it's that typical barnyard funk sourness with a bit of Ivory soap aroma. There's notes of lemon, a bit of grass, a bit of fruity citrus (tangerines, pineapples), and the sourness almost burns the nostrils.. but somehow in a good this is going to be tasty way. Taste: It's a sweet, tropical IPA with notes of pineapple, orange and lemon. The Brett is still pretty hefty in here as it's giving off a funky, sour and soapy presence. A bit of a soapy aftertaste, quite carbonated for mouthfeel, and fairly dry. This is absolutely tasty and while I used to absolutely hate Brett ales and at one point didn't understand why people loved them so much, the flavours compliment each other so well.